After a day spent detouring down to the shores of the Colorado, on Day 3, we had a long hike back up and across the Tonto Bench to our next campsite at Horn Creek. The Tonto Bench is a wide, relatively flat plateau, above the Colorado River. When you look down from the rim the wide level tract in the middle distance below is the Tonto Bench. The Tonto Bench, as seen from the rim, notice the trails! The Tonto Bench is carved atop a thick layer of 545-million year old Tapeats Sandstone. 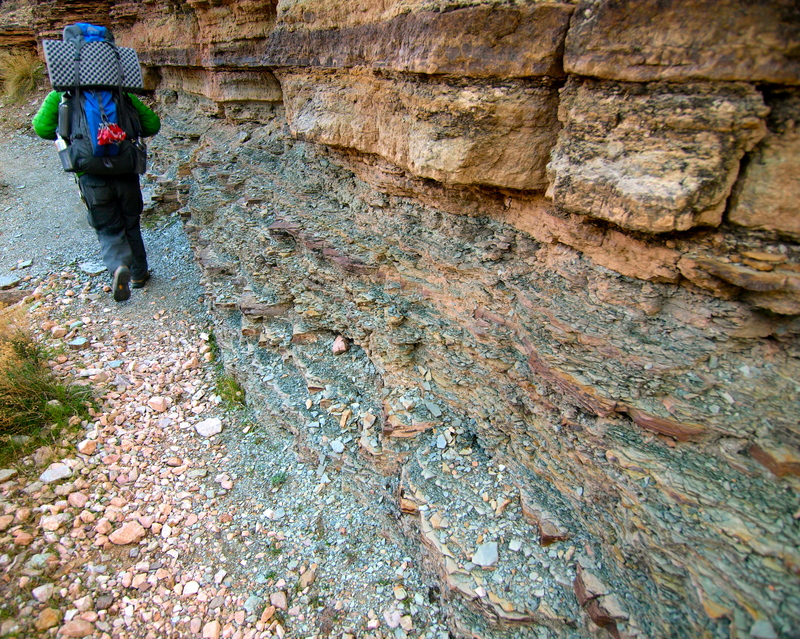 In a few places, you can see remnants of the blue-green Bright Angel Shale that used to overlie the Tapeats layer. The shale is much softer than the sandstone and most of it has been eroded away, creating the vast flat Tonto plateau in the otherwise precipitious interior of the Grand Canyon. 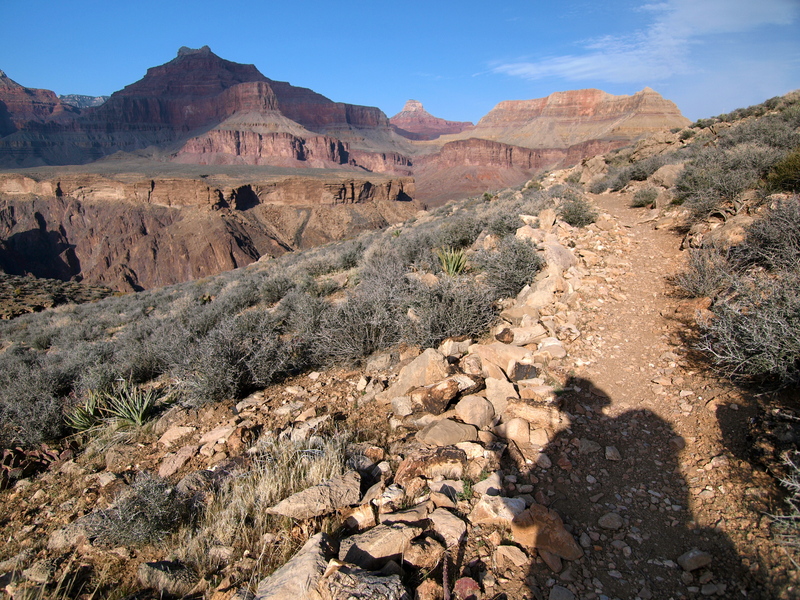 The Tonto Trail may be relatively flat compared to other paths in the Grand Canyon, but it’s not easy. The trail is rocky, uneven, usually trending a few degrees up or downhill, often within a careless slip of a thousand-foot drop. Our guide book (out of which I photocopied the pertinent pages; no sense in carrying the whole thing) called the Tonto Trail “infuriatingly indirect” and indeed it was. The trail wound in and out the drainages like a contour line on a topo map, following roughly the same elevation in a sinuous path across the plateau. The other great challenge of the Tonto Trail is the lack of potable water. Heading east from Monument Creek, the next reliable water source is 11-miles away at Indian Gardens. With our water bottles and camelbacks filled to the brim we had just enough water for two days of hiking and a night of camping and cooking. Water weighs 8 pounds per gallon and we felt heavy all the way across the Tonto. The trail crosses a few side creeks, but the only “safe” water was a critter-filled puddle at the Cedar Creek Spillway. The two other side canyons – Salt Creek and Horn Creek – are not recommended for drinking unless “death by dehydration is imminent”. Both Salt Creek and Horn Creek are radioactive due to natural uranium collected in a collapsed cave system upstream. Uranium is a hot topic in the Grand Canyon. Last year, Interior Secretary Ken Salazar announced a 20-year ban on new mining claims in the 1 million acres surrounding the Grand canyon. The Nuclear Energy Institute and the National Mining Association responded with a lawsuit seeking to reverse the ban, claiming that 60 metric tons of dissolved uranium enters the Colorado River each year from natural sources, like Horn Creek, so any impact from mining would be a tiny radioactive drop in a very big bucket. Leave it to those guys to point the finger back at Mother Nature. In March 2013, the ban was upheld by a federal judge. 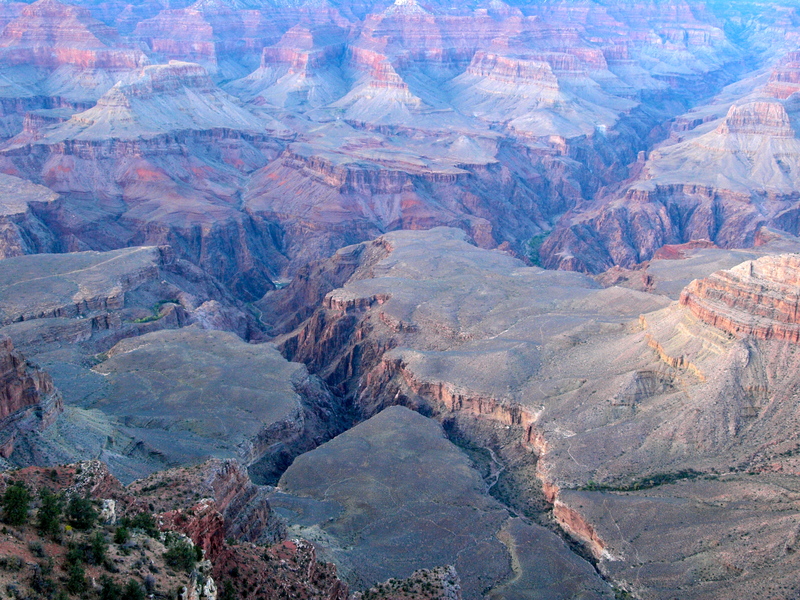 Hopefully, the Grand Canyon will be free from mining operations for at least 20 more years. The Grand Canyon has been mined before: the Orphan Mine operated at the headwaters of Horn Creek from 1956 until 1969, producing 4.2 million pounds of triuranium octoxide and 6.7 million pounds of copper. Ore was hauled straight up the canyon wall to the rim, just down-rim of the Bright Angel and El Tovar Hotels. If the guide hadn’t warned us that Horn Creek was radioactive, we wouldn’t have known just by looking at it; the water flows clear and cold and shows signs of aquatic life. Horn Creek didn’t seem like a toxic place. Despite being contaminated by scary stuff, it was still beautiful. Nature remediates itself, but only at its own rate; geologic time can’t be rushed. For February, the weather was perfect. I would not want to hike the Tonto Trail much later in the year. Even in winter, the sun was intense with absolutely no shade. I was glad for my hat, but hiking in a t-shirt, the light felt good on my bare arms. 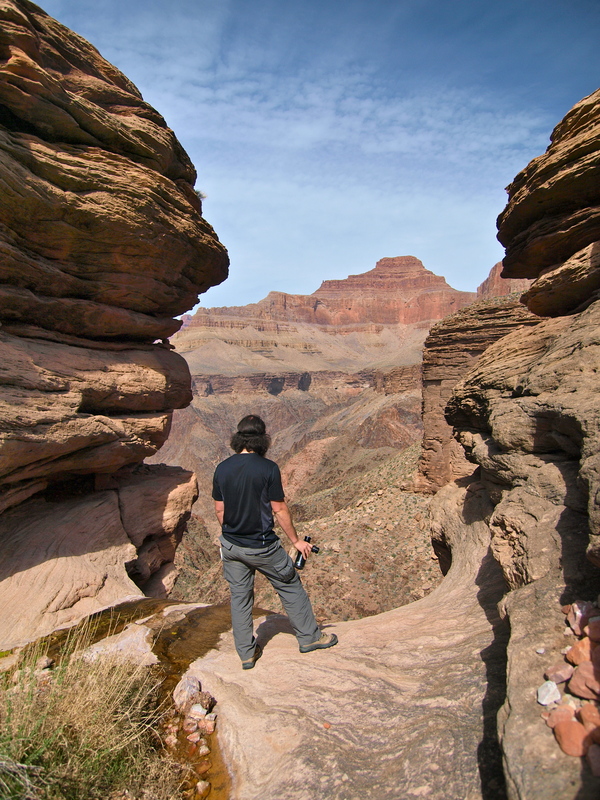 When the trail ran near the edges, warm winds blew up from the canyons below, superheated by hot rays on dark rocks. Hiking in the sun, feeling the breeze, we were as comfortable as backpacking gets; the Grand Canyon is truly a winter paradise. Chasing My Shadow on the Tonto Trail. What a place to have to yourself! 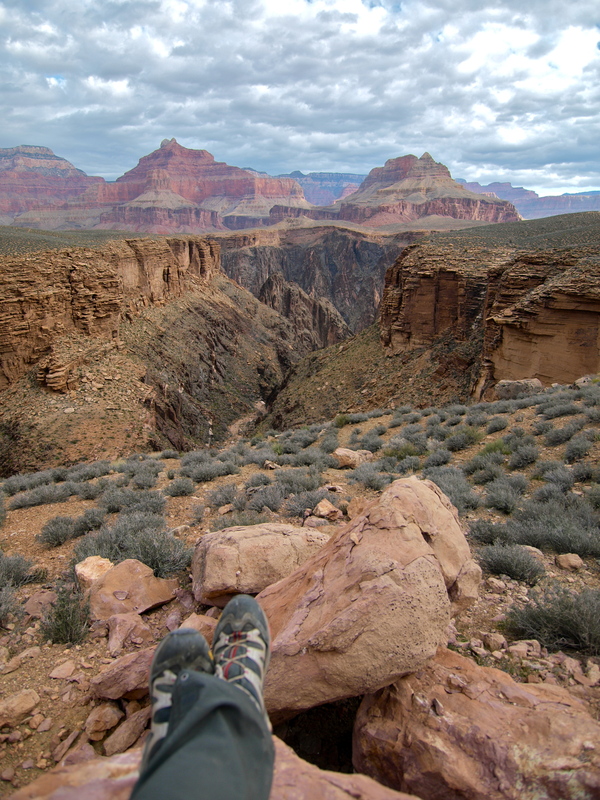 Up next: Storm Clouds & Ravens at Plateau Point and then Bright Angel Snowstorm! 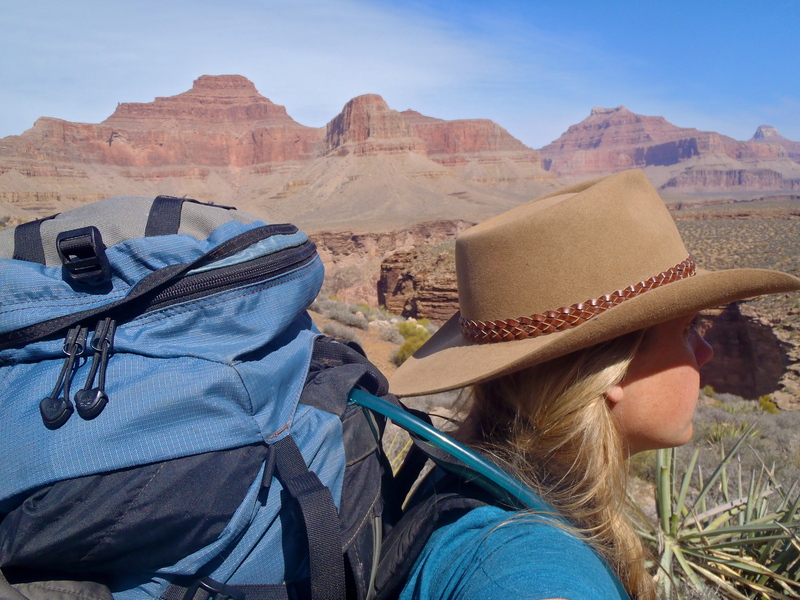 This entry was posted in Hiking!, Photography, Vagabonding 101 and tagged backpacking, grand canyon, winter. Bookmark the permalink. The scenery is amazing. What a wonderful adventure. You’re so fortunate to have the opportunity to experience this amazing adventure!